Google Search recently began showing the formula behind certain conversions such as mass, distance, etc. by displaying the conversion formula behind it. In a bid to add a little more convenience for users, Google search now directly shows the answer for certain queries without displaying any other search results. 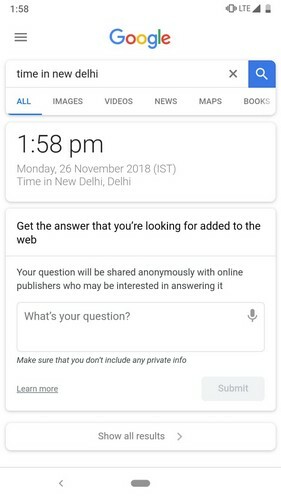 For example, if you are in a different time zone and want to know what time it is in New Delhi, just type the relevant keyword like ‘time in New Delhi’ in the search field. Once you press the search button, Google search will directly show you the current time without bringing up the search results in the form of web links. However, you’ll still see the ‘Show all results’ button at the bottom just in case you want to find out the answer for your query from a particular website by going through the search results. Similarly, if you want to convert the temperature from Celsius to Fahrenheit, Google search will show you the direct answer. In a similar fashion, you can also do simple mathematical calculations by entering the equation in the search field and hitting the search button to directly see the answer. Pro-tip: You don’t need to hit enter to see the results in Chrome. Just enter the calculation you want the answer to and Google will show you a response right under the Address bar. 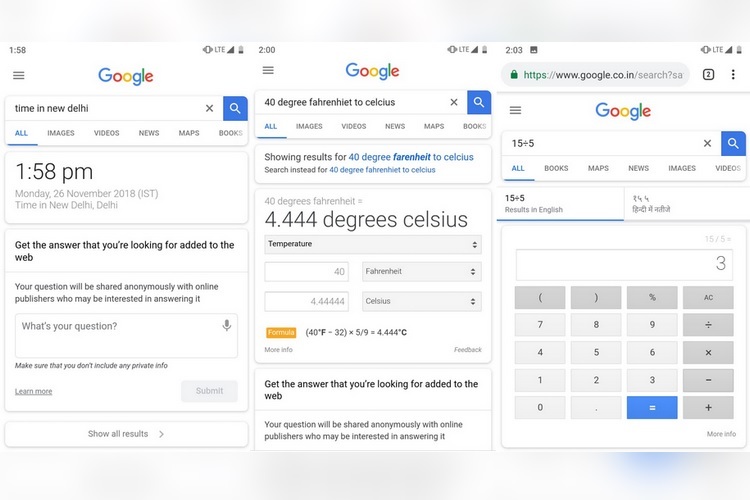 The new search format appears to be live only for a small set of queries such as time in a particular region of the world, simple mathematical calculations or unit conversions. “For queries where we have extremely high confidence that a user is seeking a calculation, unit conversion or local time, we will show a single result to improve load time on mobile”, Google said in a statement regarding the new change. It is clear that Google search will only provide direct answers to queries which the search algorithm is capable of answering accurately, and in case there is any doubt, Google search will bring the relevant search results to provide more information that is helpful to users.